There are thousands of different types of moss and most of them thrive due to environmental factors such as shade, humidity and acidic soil. 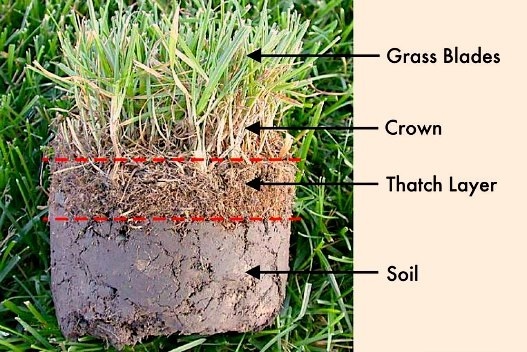 In a lawn, moss usually roots into thatch (a congealed layer of dead organic matter above and below the soil surface). It reproduces through spores. All of this means that just raking moss out of a lawn is never sufficient to remove the problem. In fact, in the long run it can become worse. During raking, thousands of tiny spores invisible to the human eye are firing out all over the lawn. Gardeners are often left frustrated when their best efforts to reduce moss never prevail. Even re-turfing won’t suffice – this is effectively placing a new lawn into the same environment, which results in the same problems. Our approach involves tackling the environmental factors, dealing with thatch and ensuring that moss no longer wants to live in your lawn. As part of your standard (Silver) treatment package, we dehydrate the moss every year. This prevents reproduction and therefore inhibits it from spreading. However, if there is moss in your lawn we would recommend either our Gold or Platinum packages. These include the standard dehydration of the moss followed by Aeration and Scarification and the application of a soil conditioner mixed with Ferrous Sulphate. 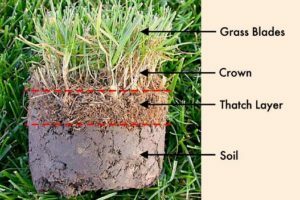 The Aeration removes the thatch that has become so compressed it has been forced below the surface – ask your Nutrilawn Greenkeeper for a Core Sample of your lawn – this will show the layer of thatch known as ‘Sub-Surface’ thatch. The layer of thatch above your soil known as ‘Surface’ thatch will then be dealt with by Scarification. Usually, this process would cause thousands of spores to spread throughout the procedure and, in the long-run, spread the moss to other parts of the lawn. However, because we have dehydrated the lawn beforehand, these spores are unable to reproduce and so most of the moss and thatch is removed from the lawn. The application of a soil conditioner mixed with Ferrous Sulphate ensures that the spreaded spores are definitely dehydrated and neutralises the soil acting as both a curative and preventative treatment for moss. This means that your lawn is no longer an environment in which moss can thrive. In the turf-care industry we recommend you Aerate and Scarify yearly to ensure your lawn’s moss levels are minimal year-on-year. Within the realms of moss control, top dressing is usually done after Aeration, and after the lawn has been mowed on the short side, with the purpose of diluting your topsoil layer with a sandy mixture that can reduce subsurface thatch and give the root zone an ideal area to thrive. Other reasons to top dress would be to gain a more level lawn – for this, gradual top dressing is continually applied until the desired level is achieved. 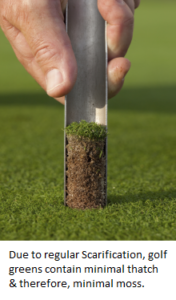 You can expect your greenkeeper to either arrive with a pre-mixed bags of top dressing or, depending on your soil structure they may choose to mix the dressing on site. After this, the dressing will be portioned into small piles evenly on the lawn and then spread thinly. A few weeks may pass before the dressing has completely sunk in. If no rain has fallen for some time after the top dressing, use a hose to lightly wash in loose material that remains on the surface. Grass has been known to grow through up to six inches of top dressing although it’s not common practice to apply this much during one visit. Your Nutrilawn Greenkeeper can consult on how much is required for your lawn and provide a quotation accordingly.